Ukraine is divided once again over its wartime history. A bitter row has erupted in the west of the country over the Soviet Red banner - an exact replica of the one which flew above the Reichstag in May 1945 as the Nazi regime collapsed. 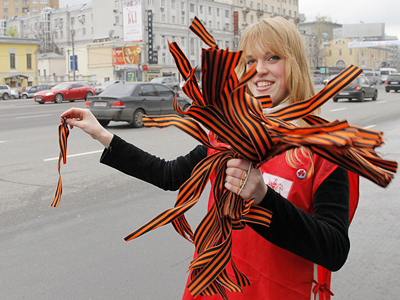 ­When the Ukrainian parliament passed a law to allow the Soviet Red banner fly on Victory Day this year along with the country’s national flag, it sparked uproar among some who view the Soviet era as a time of oppression. “Those who initiated this law are against our country. They must hand over their passports and leave to the places where the Soviet red banner is a symbol of good,” claimed Arseny Yatsenuk, a deputy in Ukraine’s parliament, the Rada. The bill was eventually passed, and on Monday, when the former Soviet Union marks the Nazi defeat, most Ukrainian cities will be adorned with both the state and Red victory flags. Most cities, but not the western Ukrainian city of Lvov, situated in a region where during the war some nationalist and anti-Soviet elements collaborated with the invading Nazis. 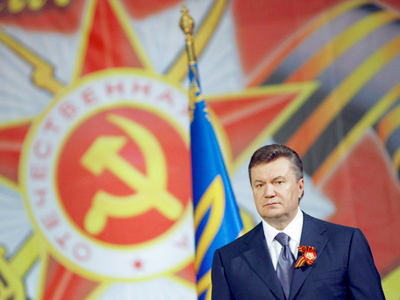 Lvov’s local council says it will not obey the new parliamentary law and intends not to celebrate Victory Day at all. There has been a furious response from anti-fascist groups, who say the council should be wound-up for failing to commemorate the Nazi defeat. 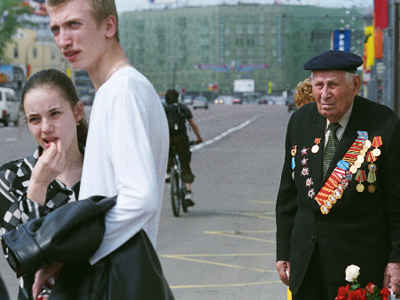 Moreover, a decision of a Lvov court has banned any marches on May 9, making it even harder for Red Army veterans here to hold their own Victory Day commemorations. Lvov has its very own monument to the Red Army soldiers. Every year, the local Great Patriotic War veterans come here to commemorate those who died liberating the land from the fascists. However, since the collapse of the USSR, every trip here is a risky adventure. Timofey Mahonek, a Great Patriotic War veteran, told RT he is afraid to put on his medals on Victory Day for fear of being attacked by nationalists. 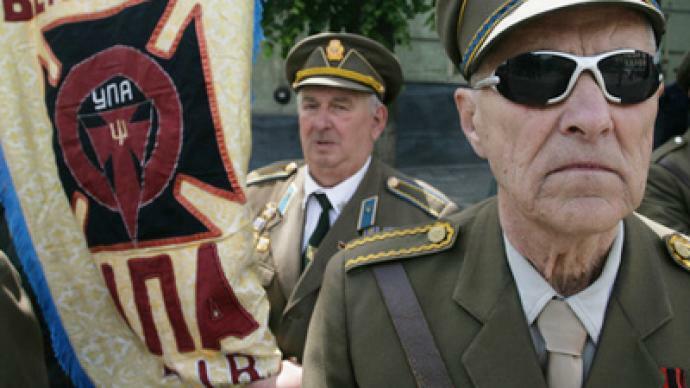 The former artilleryman fought in Lvov’s liberation from fascism, but now feels disillusioned. “It’s painful that we cannot walk in a Victory march in a so-called democratic city. It’s painful that we are not given the right to remember the dead. Is this the Ukraine I was fighting for? Definitely not,” Mahonek expresses his grief. These were the scenes last year, when Lvov’s nationalists wiped their feet on the Red banner – a sacred symbol for those who fought against the Nazis. “These people want to prove that their alliance with Hitler against the Soviet Union was the right thing to do,” claims Pyotr Simonenko, leader of the Communist party of Ukraine. 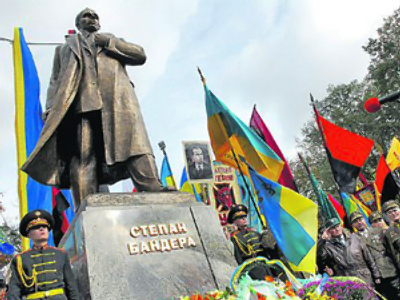 Many people in the west of Ukraine do not celebrate May 9th, with some there claiming Soviet rule was as bad as Nazi occupation. Violence has spilled onto the streets over the issue in the past. 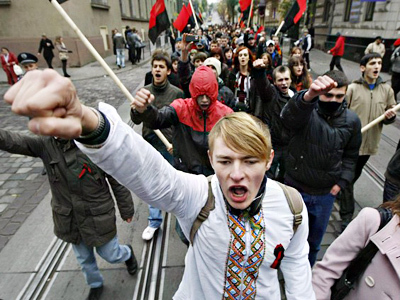 Despite the local government and court bans on Victory Day marches, and hostility from nationalists, this year, activists from the Crimea are planning a Red-banner march through the streets of Lvov. What is a day of glory and solemn commemoration for millions elsewhere is still a source of division in a place where the scars of war seem not to have fully healed.